Shirley Valentine, eat your heart out. Ven, Roz, Olive and Frankie have been friends since school. They day-dreamed of glorious futures, full of riches, romance and fabulous jobs. The world would be their oyster. Twenty-five years later, Olive cleans other people's houses to support her lazy, out-of-work husband and his ailing mother. Roz cannot show her kind, caring husband Manus any love because her philandering ex has left her trust in shreds. And she and Frankie have fallen out big time. 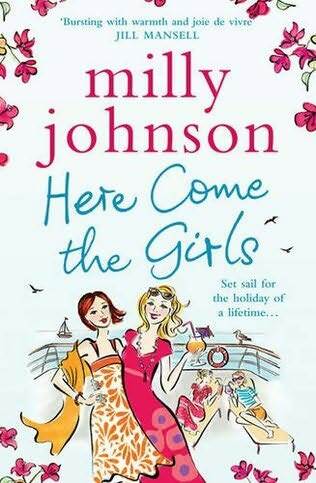 Milly Johnson’s novels have never failed to plaster a smile on my face and Here Come the Girls was no exception. I grinned and giggled away through her latest delight. I loved all the characters in Here Come the Girls and rooted for all four girls to sort their lives out in whatever way they needed to. Their problems were all so different and well portrayed that there wasn’t one storyline I was more interested in over the others. I was eager to see what would happen with each woman and even though I might have found some of their endings predictable, I still cheered at final decisions and smiled through the epilogue. There were even a few surprises along the way. The four friends played off each other wonderfully. Not once did I get confused as to who was who or who was speaking. Their banter felt natural and realistic, as did their troubles and past hurts which mired their present situations. Having traveled on a couple of cruises as a young teenager, I’ve since harboured a love for them and have always wanted to get back on board. I thought Milly captured the cruising essence brilliantly. I was flooded with memories of being a silly teenager meeting new friends, seeing new places, relaxing on board, eating delectable multi-course meals and seeking first kisses. Don’t worry, this book doesn’t come over all Love Boat like, dripping with cheesy romance of kisses on the stern, which I admit, I was somewhat expecting with it being a cruise ship and all. Instead, love, life and romance stroll along at a leisurely pace throughout this gentle ride with friendship at the forefront. I will never stop reading Milly Johnson novels. Her uplifting, feel good stories leave a grin on my face and I adore spending time in the worlds she creates and with the characters I grow to love. Well done Milly! That's another book of yours I've read in 2 days flat! I just couldn't put it down once I'd started it. I laughed out loud at some parts and had a lump in my throat at others. You continue to portray Barnsley to a T - don't ever stop! Thanks everyone for taking the time to stop by and comment - and especially Milly...it's always so lovely to have an author comment on our posts. Can't wait until the fall for your next one!!! Wonderfully written it had me hooked from the first page.....its the first one I have read of Millies but its guaranteed I will be reading her past and future books.